"My square Stickman Cuff Links are enamelled in black and white on copper and are part of my range of handmade jewellery with a musical theme. They are approximately 1.5 x 1.5cm and have silver-plated cuff link fittings. 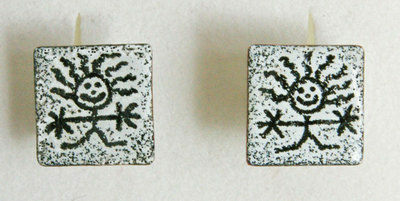 As with all my kiln-fired enamelled jewellery the Stickman cuff links are supplied in a gift box."